This morning a man died from injuries sustained yesterday/Tuesday after he was struck by a motorist, while crossing a street in the Outer Sunset. This afternoon, Bay City News Service, via the SF Chronicle, identified the victim as Dmitry Scotkin, 69. Details are still coming in (Streetsblog has inquiries out to all the relevant agencies and will update this post accordingly) but Scotkin was hit, as Tang and DeLuca point out, at a location with a recently installed “High-Intensity Activated Crosswalk” or HAWK beacon system. As Streetsblog and Kron4’s Stanley Roberts reported several years ago, compliance at these warning beacon crosswalks–despite their recent popularity with traffic engineers–leaves much to be desired. And on Tang’s Facebook page, there was a flurry of complaints from local residents about the lack of compliance with the HAWK lights on Sloat, with every indication that nothing has improved since Kron4’s report five years ago. The HAWK lights, by the way, are part of the “Sloat Boulevard Pedestrian Safety Improvements” project. But it seems additional safety features that were slated for 36th were watered down. (More on that near the end of this post). Streetsblog went out to 36th and Sloat to investigate. In other words, the HAWK lights may or may not make it safer to cross, but they certainly make it more time-consuming. Additionally, as shown in the video, in the eastbound direction the lights themselves are at least 100 feet past the stop line on an arm slung over the intersection. So flashing lights very high over the intersection, well beyond where the pedestrian is actually crossing? Streetsblog has inquiries out as to why they are placed so far away. But think about the effect at night–the human eye is drawn high up and far from the crossing by a brightly flashing set of lights at exactly the moment when they need to be looking straight in front. No wonder, even in the day, not a single set of motorists actually stopped at the stop line. Well, that, and the fact that in California violations are continually overlooked, and drivers licenses are all-but-impossible to lose, even for the most egregious offenses. A deathtrap onramp, with no crosswalk. Notice the smoothly rounded curb to enable high-speed turns. “Any six-lane highway that runs through a city isn’t safe for residents and visitors to navigate on foot. This is especially true for seniors, like the one who was killed this week, who are five times more likely to be killed in crashes in San Francisco,” added Walk SF’s DeLuca. So again, safety sacrificed for parking. HAWKs are garbage and exist only in order to blame the dead person for their own death. Shame on anyone who advocates for them. I’s almost as if this was designed to get people killed. Would anyone who designed or approved it actually use it or let their friends or relatives use it? Or was it just an exercise so someone could check off a box that they supposedly did something? Something is truly off here. I went out and hit the ped button (turning the indicator light red). I didn’t get the flashing yellow until I had already crossed to the other side, thinking the signals weren’t operational; and I wasn’t the only one who thought the signal was broken. This was a much longer delay than your video – perhaps 45 sec to 1 min. We need a Caltrans engineer out here ASAP to evaluate. Thanks for posting. I timed 36 seconds, twice (the video is cropped a little just for space and time’s sake, which I realize now might be a little confusing). But you got longer? Whichever it is, it’s ridiculous… it should start the cycle the moment someone pushes the button. It is possible that the HAWK light is tied into an ITS to sync it with the other traffic lights on Sloat. Still it ought to give near immediate response if there’s no traffic as any good ITS “knows” whether or not the main roadway is carrying traffic. A good test would be to try the ped button when traffic is light to see whether the response gets shorter, like the way that cross car traffic is treated on secondary streets. They get the green ASAP when there’s no cross traffic. Walkers should receive the same privilege. As an aside, why do we put traffic control signals behind the intersections they are designed to control in the United States? In all other countries with safer streets for both drivers and pedestrians, they are placed at the stop lines. The added benefit is that they cost a fraction as much as they can be much smaller. In typical American fashion, it is the most expensive option, not the most effective, which becomes standard. Picture this withe the lights hanging on massive masts on the far side like in the U.S.. . . .the intersection immediately becomes less ordered, more dangerous. I know a European who failed her USA driving test because she stopped *at* the signal, just as she had long learned to do in the EU. HAWKs are bad because they employ a light sequence not seen anywhere else in the road, resulting in driver confusion; and because they are placed behind the crossing, resulting in drivers not knowing where they should stop. The Pelican crossings used in the UK look much more like regular traffic signals, going from green to yellow and then to red once the button is pressed, then to flashing yellow and back to green once the pedestrian has finished crossing. When driving it’s often not obvious if the lights are just for pedestrians or also controlling other traffic flows; which is a good thing, because drivers pay more attention to lights if they think they there’s a possibility they might get hit by another vehicle. Somewhat off-topic, but in the long term I would love to see Sunset Blvd removed and the right-of-way used for BART. It could continue under Geary to the north, and to Parkmerced and Daly City to the south. And it would be cheap to build, as almost all the grade separations are already built. There aren’t many places in SF where grade separated rail could be built without requiring expensive tunneling or ugly aerials, but this is one of them. How is it cheaper? It has the same mast and same amount of bulbs as a regular traffic light. The idea is that the driver can look straight and see the signal and entire intersection at the same time, rather than looking up or left for the light. I think Sloat is an anomaly – maybe because of the way the HAWK beacon is installed, maybe because it is six lanes, or maybe as part of the usual initial confusion. HAWK beacons generally have compliance that is at least as high as conventional stop lights. A decade or two ago, I talked to a traffic engineer in Arizona, the first place where they were used, and he said that were successful because what he called “the motoring public” was so likely to obey them. “One study released by the Federal Highway Administration found that, after a HAWK signal was installed, vehicle/pedestrian crashes were reduced by 69%. As many as 97% of motorists comply with the HAWK beacon, higher than signalized crossing, or crossings with flashing yellow beacons. Some motorist confusion has been reported at newly installed HAWK beacons. When first introduced to an area, enforcement and public education are needed until users understand how the beacon works. That last sentence might explain the problem on Sloat. I’m sure this has been pointed out before but the High-Intensity Activated crossWalK beacon could be called HACK instead of HAWK – it is a cheap hack afterall. Years ago, I remember there was a signalized intersection on a divided highway portion of US 50 outside Tracy. There was an electric “Prepare to Stop” sign about a quarter mile from the intersection that came on when the light turned yellow. Since Sloat Blvd. is for all intents and purposes a divided highway, maybe that would work in addition to the HAWK. There’s not much traffic on Sunset. Some of that traffic would move to parallel streets, and some would in fact go away, because trips would shift to BART and other modes. You could also create a one way couplet out of 36th and 37th as mitigation, though I really don’t think it would be necessary. It’s true that the Sunset would currently oppose such a project, but we’re talking at least 50 years in the future here, after a second Transbay tube. Attitudes will change in that time. There’s no conflict with the M under grounding. Ten tons of rubble won’t cost anything and would save us the trouble of having to beg motorists to stop their cars. I’ll deliver it for free. With all due respect, this photo caption is incorrect and it matters. “A deathtrap onramp, with no crosswalk. Notice the smoothly rounded curb to enable high-speed turns.” A: there are no onramps onto sidewalks. Onramps go to motor vehicle freeways. That is a wheel chair cut in installed for the benefit of disabled people on the sidewalk. B: That is a crosswalk. It is, under California law, an unmarked crosswalk, fully enforceable by law. The grade separations are not already built. All the streets from Irving to Yorba intersect Sunset Blvd. at grade. The only grade separations are at Lincoln Way and Sloat Blvd. And how would the BART trains get from Sunset & Sloat Blvd to Park Merced and Daly City if not via Sloat and 19th Avenue, which would conflict with the M undergrounding that is planned for 19th Avenue? Were you perhaps thinking of a tube beneath Lake Merced? Now we are getting at the real reason that this HAWK beacon isn’t working. 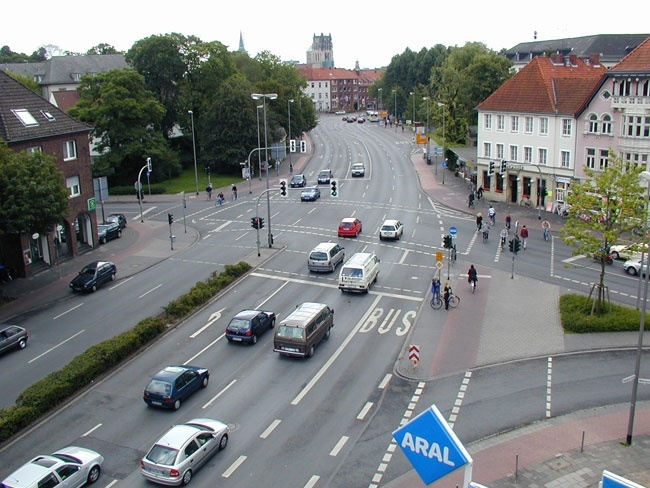 The intersection is designed like a freeway interchange, and when drivers are on this sort of interchange, they don’t expect there to be any pedestrians around. This says nothing about how well HAWK beacons work at conventional intersections. There is a new one that will be activated soon at Hillegas and Ashby in Berkeley, and it will be a much better test of how well HAWK beacons work. 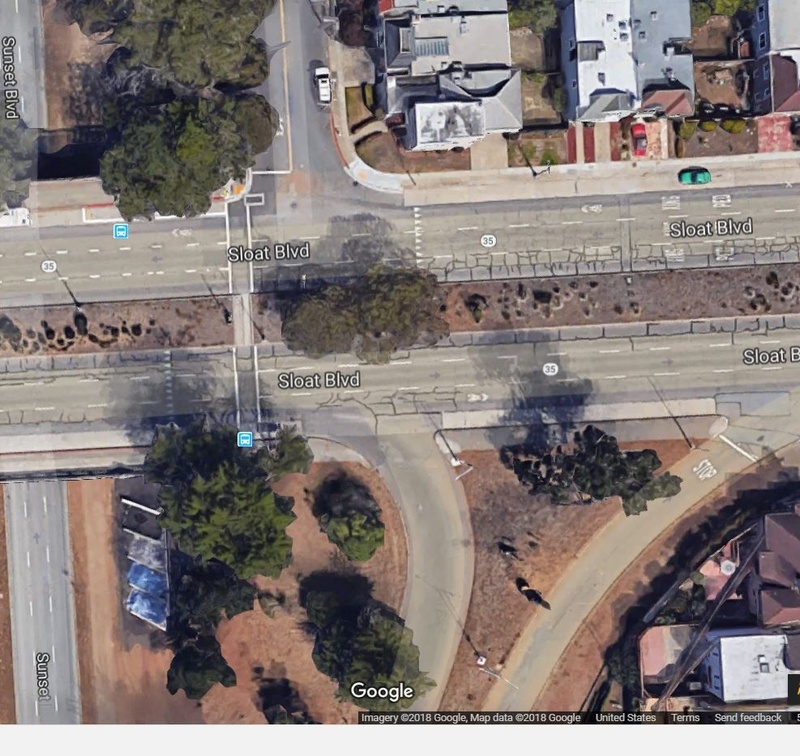 To make this Sloat/Sunset intersection safe for pedestrians, it would have to be overhauled completely. Remove the freeway interchange. Create a normal intersection where the streets cross and the crossing is controlled by a stop light. Use some of the land reclaimed from the interchange for housing. I am not saying that this will happen, but this is the only thing that will make this intersection work for pedestrians as well as for cars. A couple went up pretty recently on Grand Ave in Oakland north of Lake Merritt, as well. Why not put BART underneath 19th ave instead? That makes much more sense and it’d get a lot more riders than if it went at-grade along Sunset blvd..Like p_chazz already stated, a lot of work would need to be done if BART did run along Sunset blvd because all the street crossings would need to be changed to grade separations(I’m talking about underpasses for grade separations). Hence just put BART underneath 19th ave instead along Sunset blvd since you obviously want BART in the Sunset(which ain’t a bad idea unless you put it along Sunset blvd). Plus BART underneath 19th ave would be an easier connection to the Richmond district in terms of BART say, turning off Geary at Park Presidio and going south to 19th ave from there.